I want to commend you for your comment on Twitter today. And I also want to provide one inner city’s teacher’s take on Ferguson to give some context in response to some of the replies your message has received. 1. White privilege is rampant, still; in ways most do not even see or realize. White privilege is demoralizing and infuriating. 2. Race is a complicated issue that encompasses religion, economics, history, culture and more. 3. Overall, the self-esteem most Black kids have is not on par with most other non-Black kids. In some ways it is inflated, in more crucial ways it is disemboweled. 4. I thought I was liberal when I started teaching. Now, after 20 years, there is no way to express how much more liberal I have become. 5. It matters when famous people take a stand. White or Black, kids listen. Even if you think they are not your audience. They hear you. So k.d., you are doing a HUGE thing here with your 140 characters on Twitter. No matter what others may say, or how oversimplified your comments may seem, it matters to the myriad of Black kids who will see and hear about it. 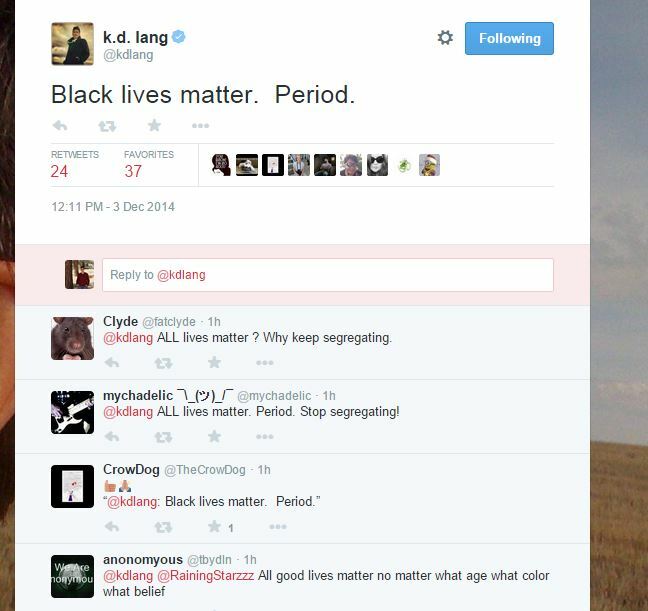 Prev Post: @kdlang on LOVE. Why is she so good at it? I can�t say that I completely agree, but then once again I�ve never genuinely thought of it quite like that before. Thanks for giving me something to think about when I�m supposed to have an empty mind while trying to fall asleep tonight lol.. ABSOLUTELY agree with you here! The more famous and non-famous say and/or yell this, the more it might get through some very thick brainless heads out there.